The United Nations’ 60th Session of the Commission on Narcotic Drugs today wrapped up a week of meetings in Vienna, Austria, where world drug policy experts advocated for stronger efforts to prevent harms associated with drug use. 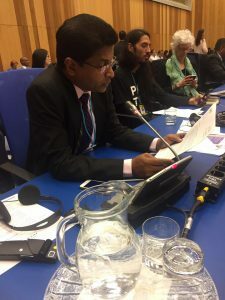 Among them was Pubudu Sumanasekara, vice president of IGOT International, an umbrella organization headquartered in Stockholm that leads some of the most informed, interesting and engaging drug-prevention efforts in the world. His message included this important point: Decades of evidence-based research of prevention and drug use show clearly that drug harm and drug-use death are preventable. The world has the tools it needs to address these problems — but it also needs the will to use them. It is an honor and privilege to address you today. IOGT International members – 133 Member Organizations from 56 countries – work with all aspects of drug-related harm: they conduct advocacy, provide prevention programs, and conduct treatment and rehabilitation interventions. They work on all levels from grass-roots to the global level. Please allow me to start by congratulating and thanking the chair and facilitator for a very successful meeting of the Commission on Narcotic Drugs (CND). – Development of supportive parenting and enabling social environments. – Promotion of skills and opportunities to choose healthy lifestyles. – Fostering of equal access to education and vocational training. In September 2015, the Sustainable Development Goals have been adopted and the global community is working to implement the Agenda2030. As United Nations Office of Drugs and Crime’s World Drug Report shows, the development perspective matters because harm caused by illicit drugs has significant impact on peace, security and development. The response to the world drug problem needs to build on the Agenda2030, especially by taking into account the conditions and needs of the most vulnerable and marginalized populations. From experience within our worldwide network, we know that Alternative Development can work, particularly when initiatives are integrated into broader agendas and driven by a long-term vision, sustained with funding and political support. Best practices show that when Alternative Development is approached comprehensively, it has the potential to break the vicious cycle trapping poor farmers. Alternative Development should become a catalyst for viable livelihoods that do not depend on illicit cultivation. Putting a development perspective at the core means that discussions about the world drug problem should no longer be dominated by Western experts, focused on Western solutions to Western problems. We urge governments to put a high priority on assuring that substance use in developing countries does not increase to the levels that exist in Western countries. We know that many risk factors and circumstances that render people more vulnerable to illicit drugs can be prevented. Putting a development perspective at the core means to work with communities and identify solutions that integrate measures to prevent as well as to reduce harm. According to data available, there has been little change in the overall global situation regarding the production, use and health consequences of illicit drugs. Data also shows that prevention and treatment of drug use work if they are based on scientific evidence and are gender-sensitive; and the excessive use of imprisonment for drug- related offences of a minor nature is ineffective in reducing recidivism and overburdens criminal justice systems. In the UNGASS outcome document, the global community emphazises the recognition of drug dependence as a complex, multifactorial health disorder characterized by a chronic and relapsing nature with social causes and consequences that can be prevented and treated. Working in communities for the prevention and reduction of drug-related harm, we are mindful of the fact that health consequences of illicit drug use continue to be a matter of concern, as the vast majority of problem drug users continue to have no access to treatment. Access to treatment and support on the road to recovery are essential public health cornerstones, which need to be part of any strategy to tackle the world drug problem. But clearly, drug use is not only a health issue that affects the individual user; it is also a public health issue. The overall positive health benefits of population-based approaches far exceed those that are available only from clinical interventions on the individual level. A public health approach to the world drug problem is characterized by the promotion of the well-being of society as a whole through the elaboration of effective scientific evidence-based prevention strategies centered on and tailored to the needs of individuals, families and communities as part of comprehensive and balanced national drug policies, on a non-discriminatory basis. We urge governments to address risk factors and structural causes of drug-related harm on a population level and in this way improve both the well being of individuals and populations. In the UNGASS outcome document, the global community has committed itself to increasing the availability, coverage and quality of scientific evidence-based prevention measures and tools that target relevant age and risk groups in multiple settings, reaching youth in school as well as out of school, among others. In light of the Sustainable Development Goals, putting prevention first means prioritizing the most cost-effective, hence most sustainable, the most people-empowering, and the most humane policy option, especially for extremely vulnerable groups such as children, women, or people from socio-economically deprived settings. For every dollar spent on prevention, at least ten can be saved in future health, social and crime costs. Prevention first, however, does not mean prevention only, and it does not mean demand reduction only. Prevention is more than that. Prevention at its best is an investment in protective factors for the well-being of children, adolescents and young people. Prevention goes beyond protecting vulnerable populations from harmful substances and helps to foster community resilience, builds stronger family ties and promotes young people’s self-esteem and self-efficacy. Needless to say, we do not think that strategies to prevent harm and strategies to reduce harm are mutually exclusive. Such a polarization is not helpful in tackling the world drug problem. Tackling the world’s drug problem requires strong international collaboration. The World Drug Report shows that illicit drug use has in fact remained stable. It is estimated that a total of about 250 million people, or 1 out of 20 people between the ages of 15 and 64 years, used an illicit drug in 2014. The magnitude of the world drug problem becomes more apparent when considering that more than 11 percent of drug users are suffering from drug use disorders or drug dependence. With an estimated 207,400 drug-related deaths in 2014, the number of drug-related deaths worldwide has also remained stable, although unacceptable and preventable. To understand the extent of the global drug problem, let’s consider the global problem caused by legalized drugs: every year more than 9 million people die because of alcohol and tobacco. Not one death from harmful substances is acceptable, especially because we have the tools to largely prevent them. Therefore, IOGT International proposes a global commitment to reduce the use of illicit drugs by 30 percent until 2030, when the United Nations’ Sustainable Development Goals will be re-evaluated. We believe that with renewed commitment and new momentum from the UNGASS 2016, this is a bold but achievable goal. With the approaches and solutions we are suggesting, and building on existing work and evidence, we look forward to collaborate with governments, UNODC and other UN agencies and civil society partners in the coming months and years. I thank you for your attention and for consideration of these points.